"Path\to\putty.exe" -load "savedsessionname" -pw "passwordstring"
What I would've hoped is the ability to auto-log in in one step, by simply d-c the shortcut, without the GUI poping up; in other words, how to specify in the command line a locally saved (session) file to be loaded by iPuTTY? Can you patch your code to that effect? Therefore, PuTTYTray does not work well. Let's take a look at some more code to see if we can fix the problem. And, instead of the "-pw" option, you can use the "Auto-login password"(#19) function in the template. All right, I modified it to use as follows. You can choose one of the above methods. Attach the build file, test it and let it know if it works, then commit and close the ticket. instead of the "-pw" option, you can use the "Auto-login password"(#19) function in the template. I loaded my saved session from file, the first time I did that in latest iPuTTY 0.70 (x86) it did not contain a saved password (the "Connection -> Data -> Auto-login password" input field was empty). If I type-in my password in the terminal, then the tunnel is established! Debugging this, I found that if I launch iPuTTY, load my saved session and then switch to the Connection -> Data tab, I am now seeing eleven (11) dots in the auto-login password input field (not the original 9), so it is my belief that when iPuTTY exits, the correct password gets mangled inside the local session file, hence a new auto-login will fail (i.e. the string sent to the server is not correct!). I fail to locate that commit hash in either the master/localization branch... how so? Right. Attached binary is compiled by 64bit, and re-attache 32bit files. And I checked the auto-login password functional test again, but it seems that I have no problem with the test results. It does not reproduce. 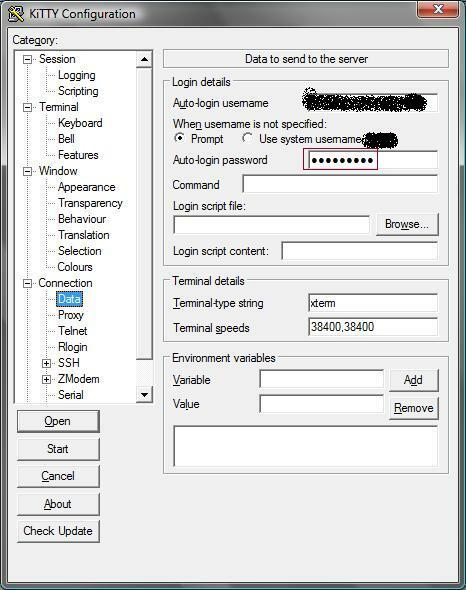 Make new file session WORK with empty auto-login password. Move Session tab and Save Work session with Sessions from file. If push commit, the issue ends automatically. So I'm still committed to the local repository. iPuTTY is a Korean localization version of PuTTY. So the issue or document is in Korean. I do realise that (the ... "of course" part of my post) and I don't blame you in any way, I just stated, for emphasis, the obvious thing: Not being able to read Korean, it was hard for me to discover documented features (unless I "Google Translate" whole pages...). Many thanks for this 👍 ; so now am testing iPuTTY-0.70.1-git-0627537-win32; OS is Win7 SP1 32-bit. 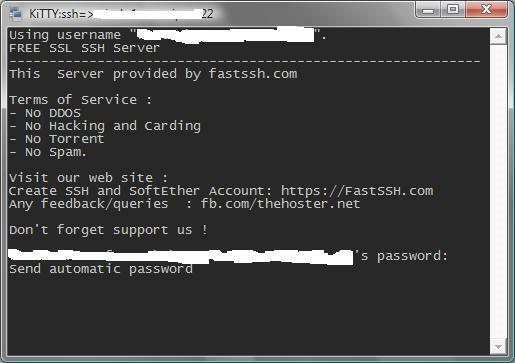 I decided to start from scratch; I loaded default settings, then modified that to my needs/liking and saved to file an SSH session named SSH_STUNNEL_UK_1 (physically stored in "./sessions/SSH_STUNNEL_UK_1"); as you suggested in your step 1, I initially left the auto-login password field empty. Manually type-in (or paste from clipboard) my 9-digit pw, I see 9 black dots. 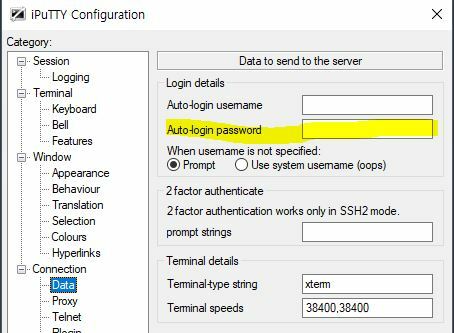 Navigate to "Sessions", saved sessions field has SSH_STUNNEL_UK_1 inside it, I click "Save" to store the newly input pw info inside the session local file. Back to "Connection -> Data", "Auto-login password", still 9 black dots are displayed. Click the Cancel button, iPuTTY 0.70.1 exits. Navigate to "Connection -> Data", "Auto-login password", now there's 11 blackdots there! Don't forget support us ! I can't code myself, but I do like testing/debugging issues; this is my small contribution towards making open source-ware better! However, in this case I've spent a bit more time than planned initially, still presented with riddles that seem difficult to solve, plus causing you all that extra work! For the time being, I think I might stay with the somewhat older PuTTYtray (by FauxFaux) and/or kitty_portable; both of them don't present any of the issues discussed in this thread (and store sshkeys locally...). Best regards, apologies for the lengthy posts! I think there are three issues in the current ticket. In my opinion, the first issue seems to work well in the newly built version. auto-login password does not work properly. For this issue, it seems that the password in memory is correct, but the password retrieved from the session is incorrect. The password stored in the session is encrypted when it is saved, and decrypted when it is loaded. Perhaps I think, there is a problem due to differences in architecture or OS version. The encryption and decryption process uses putty's base64 api. I guess there is a problem here. There is no problem with Windwos 10 64bit. I think this issue should be handled as a separate issue. It is recommended that you use the -pw option. The host key is not saved as a file. On this problems, I have no problem too. Perhaps the difference in circumstances seems to be causing problems. The issue was automatically closed due to commit push. Hello again from cloudy/rainy Northern Greece (just this day) ! One issue has been complicated by various problems. Are you aware of the English expression: Opening a can of worms ? Couldn't agree more 👍 This issue is definitely fixed! when it is loaded. Perhaps I think, there is a problem due to differences in architecture or OS version. The encryption and decryption process uses putty's base64 api. I guess there is a problem here. There is no problem with Windwos 10 64bit. I borrowed a friend's laptop with Win7 SP1 x64, so on this OS I could test both 32-bit & 64-bit binaries of iPutty. I first tested the x86 binary used previously in my tests on my own laptop, i.e. I click "Save" to store the newly input pw info inside the session local file. So, this bug is still there in the x86 flavour of iPuTTY (load from file - in the iPuTTY GUI - a saved session containing auto-login password info), even on Win7 x64 ! when I click Open button, the pw sent to server is being authenticated and SSH session starts! Will have to, being able to only run the x86 binary on my OS; or load from file the session (which includes pw) via the cmdline/win shortcut (which, for some inexplicable reason, works; i.e. pw decrypted correctly from the cmdline, incorrectly when loaded via the GUI). I am but a mere tester, doing my small bit (thank you, though, for acknowledging testers' contribution to open-source projects, many authors only care for PRs!). The original issue is clearly resolved, so I close this ticket. And, additional issues will be tracked with other tickets. KiTTY saves the password as plain/text. Therefore, there is no decryting problem. KiTTY saves the password as plain/text. Therefore, there is no decry(p)ting problem. Hi; if you're indeed saying that KiTTY stores the Auto-login password string inside the locally saved session file without encrypting it, I found no evidence that supports this claim.